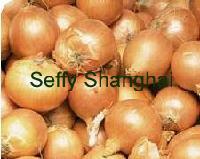 Onion from China Shanghai , Onion manufactory Shanghai Seffy Trading Co., Ltd.
Big bulb, round, yellow flesh, crisp and tender, Onion belongs to the lily family. Its tender yellow flesh smells light pungent. It contains vitamin B & C besides sugar.